FXBOT.MARKET is a Marketplace where buyers meet sellers. Our marketplace supports multiple product types, including FX Trade Bot (Automated Trading Strategies), PDF files (such as eBooks, Training materials), Script files, indicators, Robots (such as Expert Advisors), Downloadable Software, .set files, and more. We're open to expanding product types on an as needed basis. Our core marketplace uses a heavily modified Joomla core with extensions like Virtuemart that have been reverse engineered from the ground up. Joomla provides a stable user sign on and accounting experience, while Joomla's extensive extensions library provides functionality needed for various marketplace operations, as well as common components like Forums, Support, Ticketing systems, and more. FXBOT.MARKET allows vendors to charge whatever they want for their products, we take only 25% of the fee. This covers not only the costs involved, but it also includes our partner program. As part of our marketplace we host a world-class affiliate system, paying a percentage of all sales to our marketing partners. Individual product types may have specific rules, for example FX Trade Bot includes a $10 monthly fee which is the cost of the Cloud based Trade Copy service. As you can see from the diagram above, FXBOT.MARKET not only connects buyers to sellers, but performs important operations such as due diligence, process automation (that means we setup the bots for you - too! ), and vendor services like marketing. Most end users may not realize that trading system providers spend a lot of their time and money obtaining clients, which can distract them from their core business of trading. Also there is a high fraud risk in the online FX world, so FXBOT.MARKET ensures that all vendors are not fraudulent. To be clear, we are not claiming or stating in any manner that performance of their robots will be good. We are claiming that they will not be fraud vendors. Results will be checked, vendors will be checked, we will do more than your standard due diligence & criminal background checks. We will get to know them and ensure to our buyers that at least they have a trusted source to choose from working systems. There is a shift towards automation in every industry. From manufacturing to self-driving cars, robots are taking over. Software trading robots pose several key advantages to human traders, including but not limited to being unemotional, being able to execute orders 24/7, and being able to be tested statically (you can't run a human trader through a simulation and even if you did, it wouldn't necessarily behave the same). Robots will perform exactly as they are programmed to. They are not perfect, there are flaws, they can lose - but the point is that compared to non-Robotic trading they pose several key advantages. The huge drawback of using robots to do your own trading is selecting one, because of the trust factor. Sellers of robots can be good at sales but not good at robotic development. That is the problem FXBOT.MARKET aims to solve. Also there is another problem with robotic trading, it is not easy for the end user. While trading platforms like Meta Trader 5 and others have made the development and execution of robots very sophisticated, they can be difficult to setup and run for those who are not computer savvy. Like with the recent flurry of Crypto activity - most of the users of robots have been traditionally 'techies' such as traders, programmers, I.T. staff, and other technical people. We hope we have eliminated that as much as possible, and with our Botomation technology we've streamlined and automated things like Robot setup, optimization, and risk monitoring. 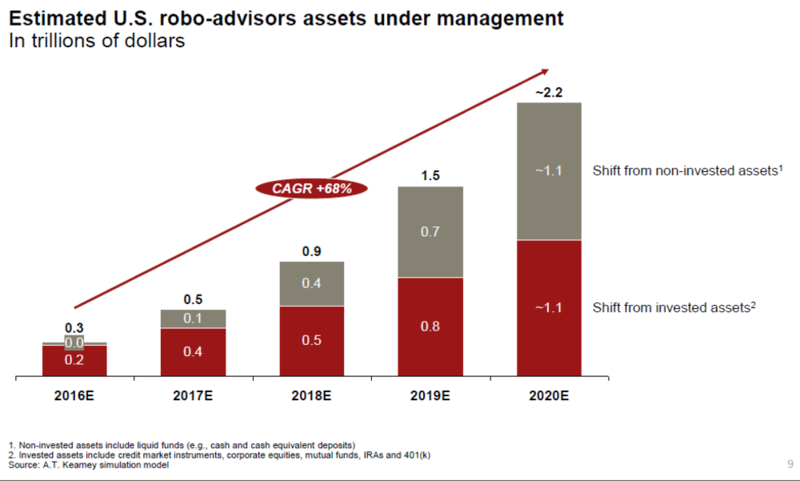 Robo-advisors in the USA alone are expected to manage $2.2 Trillion in Assets Under Management if the current trend continues by 2020. But the "Robo-Advising" they are referring to is different - they are replacing financial advisers. Here at FXBOT.MARKET we aren't offering financial advisers, we are offering real trading strategies that are fully automated, for the FX markets (in the future we want to offer other markets). Our model is not regulated, that means individual clients will trade their own self-traded accounts with Robots leased or purchased from FXBOT.MARET. It is a companion to, not a competition for, Robo-Advisers. As the algorithmic trading industry evolves, we believe more and more will choose to use our transparent marketplace model, rather than the human-centric opaque 'trust me' model. Our current build enables us to connect to more than 3,000 FX brokers; but as we evolve we plan to link to other platforms, other markets, and other trading platforms. 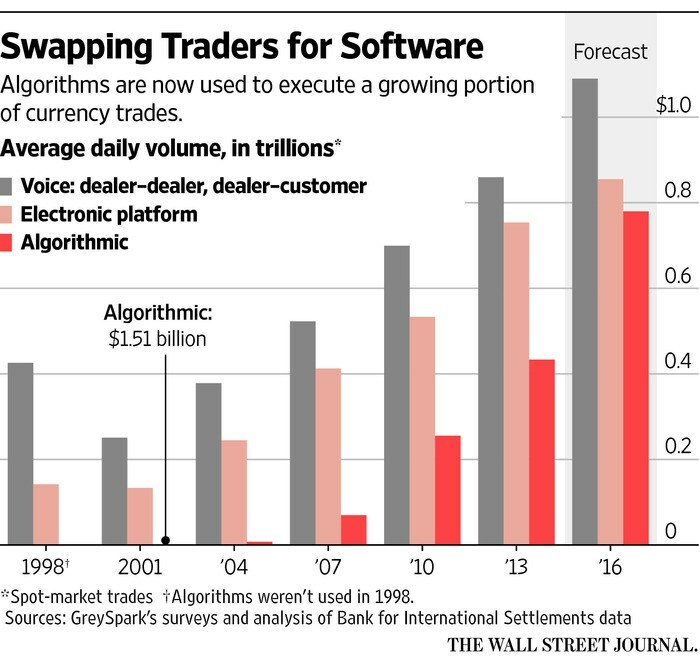 The algorithmic trading space has a long way to grow. FXBOT.MARKET wants to be the NYSE for algorithmic trading systems.